Come in to our office to sign the petition! Do you want to help keep medical decisions for children between parents and doctors and protect your parental power of choice? Right now, if you do nothing, the government will be deciding which vaccines your school children have to get, and when they get them. What you think, what your doctor thinks, and what the school thinks will not matter. There will be no personal belief or religious exemption. 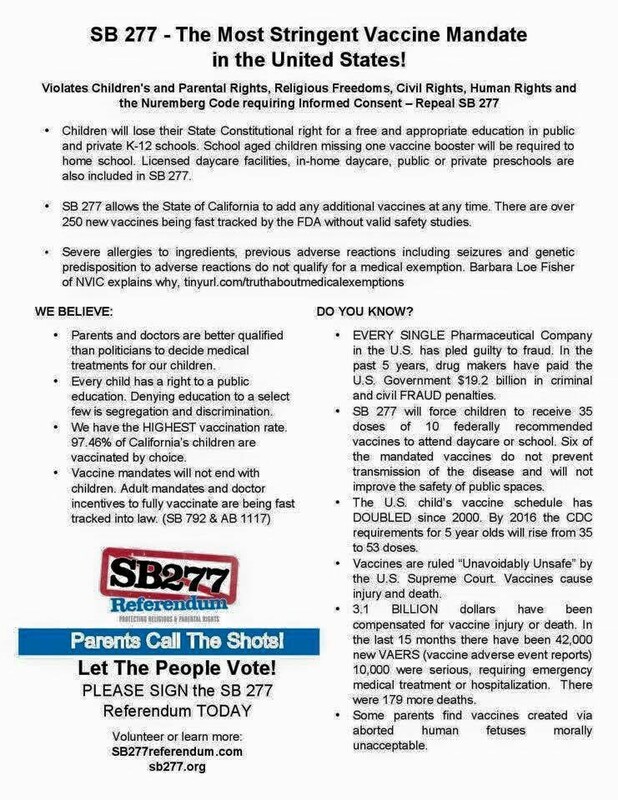 On June 30, 2015, politicians passed a bill in California (SB 277) which takes away a parent's power of choice whether to get their children vaccinated or not. If you choose not to vaccinate this will affect your ability to get your child into public and private schools. SB 277 mandates vaccines for all school vaccinations, even vaccines which are for diseases which are not contagious, and also for, "Any other disease deemed appropriate by the department." There are other laws in California (SB792 and AB 1117) which are now on the fast track to go into law that will further mandate vaccines for adults, meaning you. Signing this petition and voting when it appears on the ballot will return your health care decisions to you. Drug companies have paid $19.2 billion in the last five years in criminal and civil FRAUD penalties. There is ample factual data to point to the fraudulent presentation that vaccines are valuable to begin with. I have read 3 books on this matter presenting over 1200 facts, statistics, and views from victims, medical doctors, lawyers and others. Vaccine damage by federal law exempts manufacturers from penalty and prosecution so drug companies wish to expand their use. This petition signing and later voting is your chance stand up and protect your civil rights. As you can imagine, SB 277 is being deemed unconstitutional by many, and there are lawsuits being organized. However, the EASIEST way to repeal this bill is through a referendum which is in the works. We need 400,000 signatures by September 28, 2015 to get the bill on the ballot for a popular vote in Nov 2016. If you have any questions about this bill, if you sign the referendum, it will give you more than one year to educate yourself on the matter before you will need to vote on it. Right now, if you prevent your child from getting even one vaccine/booster, he/she will not be able to attend ANY school in California after July 2016. If you want to avoid this, please come sign the SB 277 Referendum Petition. You can sign the petition at our office if you are registered to vote in LA County.